With another Virginia winter bearing down, many homeowners are looking for ways to take the chill off their homes, enhancing warmth and comfort for the holidays and beyond. If you find yourself shivering through the winter months, it’s time to investigate ways to warm up your indoor environment—besides just turning the thermostat as high as it will go! 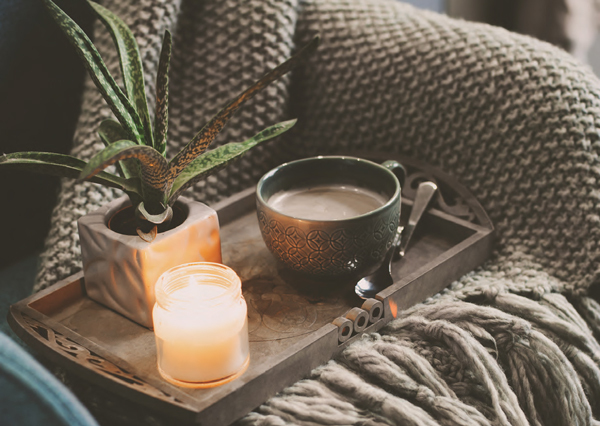 There are things you could be doing to increase your “coziness quotient” this winter: from large-scale professional home improvements, to small-scale DIY projects and purchases, there are options that will increase your comfort no matter what the weather brings. Grab a mug of hot chocolate and your favorite fuzzy socks and see what’s out there to warm up your home this season. If you have the time, budget, and inclination for a large scale project, consider active or passive solar systems, which promise increased comfort for a fraction of the cost (once installed) of oil, gas, or electric systems. “Active” solar refers to solar panel systems which heat air and often provide some hot water as well, even storing a certain amount of heat energy when the sun isn’t shining. “Passive” solar systems such as sunrooms or solariums absorb the sun’s heat without external devices, so homes with passive solar heating will only “heat” when the sun is shining, and can’t be used as a home’s only heat source. Though solar technology is improving exponentially from its early years, and we are seeing more and more solar panels around Virginia, the upfront costs are still considerable, so it isn’t for everyone. Radiant heat flooring is another project that involves running a series of connected heating coils underneath your home’s flooring, which radiate heat up throughout the room. This project has traditionally been done under tile or concrete floors, but new technology allows for radiant heating to be installed under hardwood or even carpet. The good news is that it can be done in one room at a time. For instance, when renovating a bathroom, radiant heat coils can be installed underneath the floor tiles—a tremendous difference when your bare feet touch that tile first thing in the morning! Insulation can be a tricky subject. 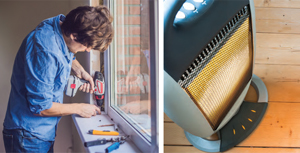 You know you want to keep all that lovely heat in your home, but where to start? Windows? Doors? Walls? Attic? 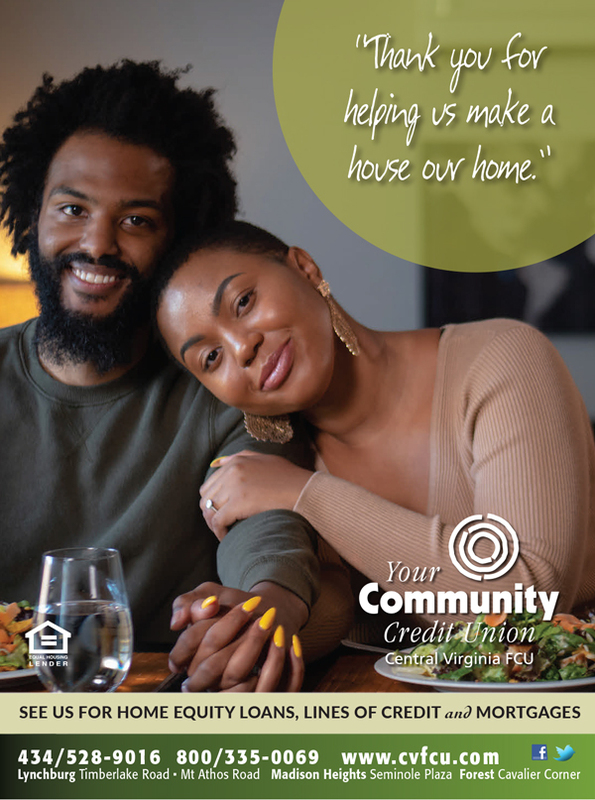 Every home can benefit from at least some additional insulation, and it’s easy to get overwhelmed. An energy “audit,” or consultation, can help homeowners identify where a specific home is losing the most heat and therefore, where those insulation dollars can best be spent. In older homes, the biggest heat loss often occurs around windows and doors, and homeowners are advised to look into more efficient replacement windows and doors with double paned glass. Other common heat loss culprits are areas such as attics, crawlspaces, basements, and garages. An energy consultant can help you identify where you are losing the most heat, and make recommendations about the best insulating products for your home. Sometimes your furnace just isn’t enough. Some homes, or rooms, need a boost of extra heat. This is where supplemental heat sources such as space heaters, fireplaces, and wood or pellet stoves can make an enormous difference. Running the gamut from a simple plug-in space heater to the engineering marvel of cleanburning pellet stoves, there are many options for homeowners to choose from. When selecting a supplemental heat source, keep in mind both purchasing cost and cost to run—there can be a huge discrepancy between the two. Electric space heaters can be inexpensive to purchase, but quite a drain on your electricity, while gas or wood fireplaces and stoves require a high installation cost, but are extremely cost effective to operate. Remember, too, that winter heat is dry heat. This dryness can take a toll on our skin and hair, our lungs, sinuses, and our general health, but did you know that dry heat can also make you feel less warm? To combat this, consider ways to add humidity back into the air: a simmering pot of mulling spices on your stove, a plug-in room humidifier, maybe even investigate a whole-house humidity system. Looking for some easy to implement ideas? Start with your window coverings. These should be layered, just like your winter clothing. Blinds or shades will help with insulation, and lined drapes will help with drafts. During the daytime, take advantage of the natural warming ability of the sun by opening all curtains and blinds covering sunny windows. Once the sun goes down, quickly close up again to retain the warmth and to insulate against heat loss. Augment your furnace’s efficiency by replacing air filters monthly, moving large furniture away from air vents and radiators to ensure proper air flow, and refrain from “thermostat whiplash”— constantly adjusting the temperature manually, which can overwork your heating system and drive up your heating costs. You may also need to upgrade your thermostat. 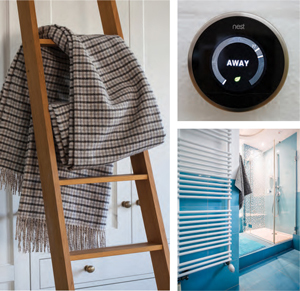 Today’s smart technologies enable you to program thermostats (in some cases, even from your mobile phone) ensuring cozier temperatures at key times of the day—early morning so that you awaken to a warm house, and evenings after work through dinner and bedtime—while scaling back when the house is empty or everyone’s asleep. There is a Scandinavian saying that goes, “There is no bad weather, only unsuitable clothing.” This applies to home goods as well as clothing. Just as we’d hesitate to wear the breezy fabrics and styles of summer clothes in midwinter, our home’s “clothing” should also change with the season: flannel sheets, fleecy throws, and plush area rugs help create a toasty feel on cold winter nights. In the bathroom, warm up icy floors with space heaters, plush bathmats, and towel warmers. It may be time to upgrade those old towels as well—the thicker and plusher the towels and rugs, the cozier they will feel. In the bedroom, insulate with thick carpeting, draft-proof window coverings, and bedding that is warm and inviting. You may appreciate the health benefits of sleeping in a cooler bedroom, but very few people enjoy shivering under the covers. Electric blankets and mattress pads will warm a bed with the flick of a switch, and there are the triedand- true methods of flannel, down, wool, and fleece. Try heating a rice bag in the microwave or filling a hot water bottle for your feet before retiring—nothing is quite so comforting as warm feet as you drift off to sleep!